As wireless connectivity becomes the norm rather than the exception, colleges are finding greater uses for handheld PDA-type devices that can simplify everything from taking food orders to checking students in during an event, such as a football game. Meal vending, picnics, field trips, photo or event verification, even shuttle buses all lend themselves to handheld usage. One thing’s for sure: colleges certainly have a variety of wireless devices from which to choose. But for a handheld system to be effective, the campus must first have an ID system in place. “This system is the backbone and provides the means to make the magic happen on the handheld,” explained Vision Database Systems’ Emil Bonaduce. VDS, which has been supplying ID card and tracking solutions for more than 15 years, uses several handheld devices from various manufacturers. “Our applications are written to be compatible with devices running on the Pocket PC Operating system,” he added. a third group supplying software – and sometimes hardware – to run on handhelds (e.g. VDS, Sequoia, Tokenworks). Bottom line purpose for any handheld used on campus is to pull up information stored in a database for the card just scanned by the device, said Mr. Bonaduce. “Handhelds provide an excellent way of ensuring that students do not defraud a sporting event system, for example, by passing their student ID to others to gain free or discounted admittance,” said Mr. Bonaduce. The company’s PockeTracker Red/Green application “can allow one ID one entry (flashing a green symbol) and then deny entry to all subsequent presentations of the ID (via a red symbol),” he added. Added General Meters’ vice president, Jeff Zander: “They’re used to verify someone who says they paid for an event. The card is swiped and a photo is displayed along with a pass/fail status. This keeps students from giving their card to a friend if they know a second level of verification will be a photo ID.” General Meters produces the Pocket 1Card as an extension of the company’s University One-Card System. Pocket 1 Card is a software package and a card reader designed to operate on a PDA using the Microsoft PocketPC operating system. General Meters has a handheld that can be used as an access device, he said. A list of people who have access rights to a facility–be it a dormitory or a lab–is downloaded to the device. As the student enters, the card is swiped or an account number is manually entered, and a pass or fail light determines if the person can gain entrance. General Meters’ Pocket 1Card, like other applications, can accept meal plans. “No pre-wiring is needed and no setup is required. The appropriate data is downloaded to the Pocket 1Card which will then read a student’s meal plan eligibility,” said Mr. Zander. Campus card provider CBORD offers two varieties of handheld card readers “allowing users to process transactions at any location, regardless of power or network connectivity,” said the company’s president, Bruce Lane. “The readers are frequently used at athletic events, picnics, concession sales, conferences, and other on- and off-site events. In online mode, transactions are processed in real-time, using a wireless network. (Alternatively,) transactions are verified against an offline database downloaded to the device before the event. Transactions supported include sales, activities, and balance inquiries (when online only).” Reporting, he added, is available from either the handheld or the company’s campus card system, Odyssey PCS/CS Gold. Sequoia has customers “who have used the devices for food delivery and even at locations such as off-campus coffee shops where student groups have held functions and needed to track attendance and charge admission to events,” said Mr. Diaz. The company also has customers “who use them on shuttle busses whereby students must swipe their card upon entering the vehicle where they are then validated as to whether they are entitled to ride the bus at no charge or if they must pay for the trip,” said Mr. Diaz. Some applications don’t even need a database or access to one. For example, you can verify the data on a driver license, ensuring that the data encoded on the magnetic stripe or bar code matches the info on the license. Similar software can also determine if the person holding the license is of legal age to purchase alcohol, said Mr. Bonaduce. 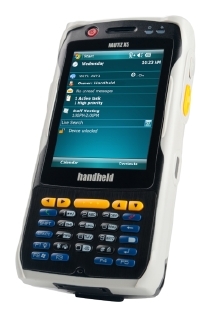 This handheld device gives system administrators the ability to use a wireless online connection to view patron information and reader status, lock and unlock doors, and perform system administration functions. “The AdminPDA also has a patron lookup feature which allows users to see demographics and pictures of cardholders,” he adds. How about durability and battery life? You get what you pay for, suggests Mr. Bonaduce. “Some of the devices are fairly fragile while others can be dropped from ten feet onto pavement and not receive a scratch. There are also third party suppliers that produce aluminum or steel cases for common handheld devices for further armor. Basically, if one is willing to pay for durability, obtaining a robust handheld device is possible. If cost is a concern than handling the device with care becomes a priority,” he adds. Mr. Diaz agrees. “We support several different devices, but with our primary units, customers can expect run-times ranging from 10 to 14 hours of continuous use. This battery life can be greatly extended by doing things such as turning off the touch screen backlight after several minutes of inactivity and having the device automatically go to sleep when it is not in use.” Using these power-saving tips means a handheld can “be used over several days without the need to be recharged,” he said. While handheld usage on college campuses has grown over the last couple of years, there is still much more to come. “Wireless, debit, access, financial and transit applications will continue to evolve with the size of the device continuing to decrease,” said Mr. Zander.